The Mercedes AMG GT range receives minor styling tweaks, technology updates and a new interior. 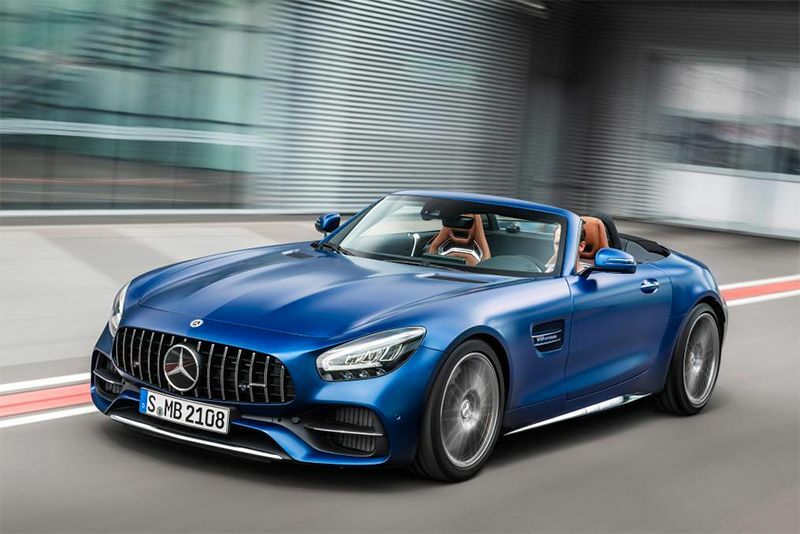 Unveiled at the 2018 Los Angeles Motor Show, the 2019 Mercedes AMG GT range is now on sale and, although prices have increased across the board, Mercedes claims deliveries will start in March this year. A quick look at the exterior revisions reveals minor changes such as LED headlamps, new daytime running lights and new tail lights. There are also new alloys to choose from as well as a fresh range of paint colours. The GT and GT S models receive fresh black sill covers too. Each model of the GT range receives it's own styled exhaust covers, with the standard AMG GT getting round ones, the GT S and GT C gain trapezoid-shaped ones, and the GT R received the central exit exhaust, as per the current car, but gains two fake exhausts on either side. Why nobody understands. The biggest changes have happened inside. Mercedes has included a new 12.3-inch digital instrument cluster and a 10.25-inch infotainment system. The leather AMG steering wheel from the GT 4-door coupe with integrated displays has also been installed with the colour display switchgear on the centre console. Glancing at the spec sheet under the skin reveals technological revisions such as AMG’s Track Pace system. This includes a data logger that tracks acceleration, braking and lap times, and displays it on the infotainment screen with a map of the circuit being driven on. Famous tracks such as Spa and the Nurburgring are pre-loaded, but more can be added too. The GT receives the AMG DYNAMICS to its traction control system, offering various modes including “Basic,” “Advanced,” Pro,” and “Master.” Apparently, the system calculates how the vehicle will react when being driven hard and compensates accordingly without noticeably interfering with the driver. Basically, it'll make poor drivers feel like driving gods. Under the bonnet is Mercs 4.0-litre, turbocharged V8 powerplant and seven-speed automatic cog-swapper on all models. GT Coupe and Roadster models produce 469bhp and 630Nm of torque and will crack the 0-62mph sprint in four seconds, topping out at 189mph and 188mph respectively. Fora little more money, the GT S Coupe and Roadster models pump out 514bhp and 670Nm of torque, will do 0-62mph in 3.8 seconds and go on to a top speed of 193mph for the former and 191mph for the latter. They also receive some extra equipment too, including an electronically-controlled AMG limited-slip differential and AMG Ride Control sports suspension. Clients can choose from 19-inch and 20-inch ten-spoke alloy wheels. At the top of the range sits the GT C models of both Coupe and Roadster. The extra cost delivers extra power too in the form of 549bhp and 680Nm. The extra horses propel the cars from 0-62mph in 3.7 seconds, the Coupe climbs to 197mph and the Roadster to 196mph. More money means more kit, the GT C receives AMG rear-axle steering, keyless go, electrically-folding and automatically-dimming wing mirrors, an automatically-dimming rear-view mirror, a Burmester surround sound system and a panoramic sunroof on the Coupe. Mercedes offers a range of optional extras in various packages. Clients can option a Premium Pack for the base-model GT, which adds extras from the GT C, like a superior sound system, keyless go and a panoramic roof. The AMG Carbon Fibre package says what it does on the tin, with carbon fibre replacements for the GT’s rear diffuser, front splitter, air intakes and mirror caps. There's privacy glass for the rear windows too. Prices range from £104,130 to £144,230 and the packages mentioned above go for between £3,000 and £5,000. For those that still want more, a flagship AMG GT R Pro has been introduced. Price is yet to be released but it will be more track-focused, with 577bhp, suspension tweaks, the customary diet to make it lighter, and new aerodynamics to help it go faster and handle better.